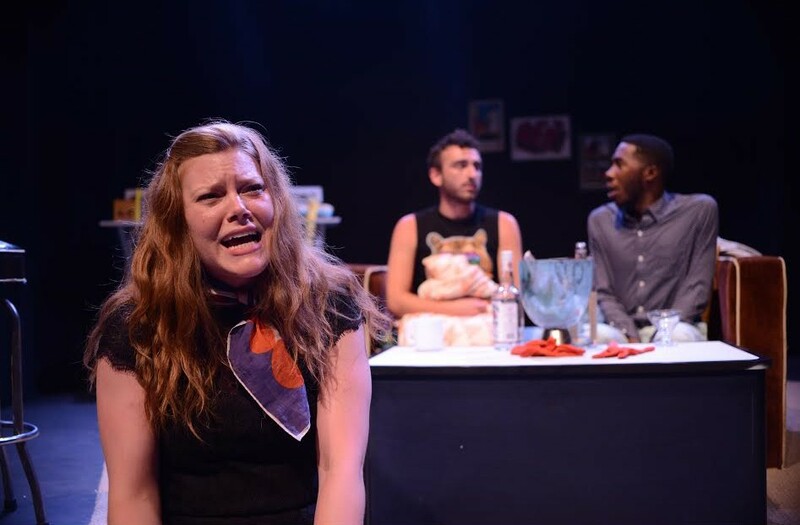 (from left) Kyra Baker, Matt McWilliams, and Terrell Green in David Kimple’s MMF, playing at GayFest! 2016. MMF, the penultimate play in GayFest!, is a look at a modern kind of love triangle, and it begins as a closed circuit. Dean (Matt McWilliams), cozy in a blanket on the couch, is joined by Jane (Kyra Baker) and Michael (Terrell Green). They come in for a last snuggle before heading to work. Sadly, this is the first and last time they’re all together and happy. As soon as Jane and Michael leave, Dean dramatically casts down his blanket to reveal a hidden martini, and it’s not his first. Time shifts to a sadder future, when Michael has left, and Dean and Jane try to understand who they are without him. 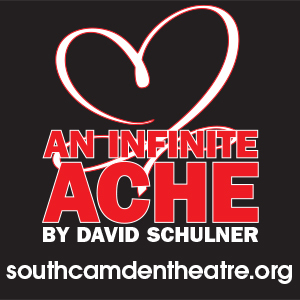 Throughout the witty monologues, dialogues and trialogues, skillfully directed by Shamus Hunter McCarty, the characters uncover the truth in all the permutations of their relationship. Dean is our guide and narrator through this maze of feelings. He is still in love with Michael. He philosophizes about love and infatuation and plays with words (flesh out or flush out?). When he reminisces on some bittersweet memory, well distinguished by John Allerheiligen’s lighting shifts, his and Michael’s chemistry is palpable and sweet. Dean and Jane have more of a mother-child dynamic. Dean spills something, and in the way Baker calmly says, “Cool. I’ll clean it up.” we can feel her eye twitching. When they try to be intimate, however, it’s obviously one sided. Jane and Michael’s relationship is less defined, but it makes sense when they all come together. Their three-way conversations are quick and funny and knowing of each other. Jane and Michael know how to keep the flighty Dean on task, and call him out for “retro-justifying” his actions. Moments of tenderness between Dean and Michael are broken with Jane’s perfectly delivered “This is awful!”, or other such commentary. Dean and Jane goof on acting and exchange impish smiles when Michael is lecturing. They zip around with funny retorts and games. All of the actors have impeccable timing in these scenes; they never let the beat drop, but allow some space for the emotions to breath. These characters are flawed and fun, and carry us with their momentum. By the end of MMF, all have professed their love and been dumped. Watching them breakup is sad and slapstick and thoughtful all at once. They realize that even in a relationship with one person, there are really two relationships: the one you have with the other, and the one they have with you. The magic, as Dean sees it, is when you have the same feelings at the same time. 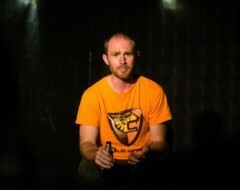 David L Kimple’s play asks if that’s possible with three people. Is it possible with two? [Bluver Theatre @ The Drake 302 S. Hicks St.] August 19-27, 2016; quinceproductions.com.